This program will allow me to try research for the first time. It will help me discover if I have a passion for research and will be incredibly influential in shaping my future career path as an engineer. At this point I’m not sure what type of engineering I want to pursue and this program will give me the chance to learn about nanoscience and terhertz research, which is something I know very little about. Doing nanoscience research in a technologically-forward country like Japan will be incredible. Given the central role of Japan in technology development and the international nature of engineering, it is likely that my future career will involve working with people from Japan at some point. Having this experience will foster greater understanding and allow us to work together more effectively. Growing up I’ve spent quite a bit of time in South Asia but have never been anywhere in East Asia. I couldn’t be more excited to be given the opportunity to spend the summer living and working in Japan. Additionally, I am keen to learn some Japanese and put what I know to use in daily life. It will be empowering to have some footing in the language. I am also looking forward to eating lots of delicious food and exploring the country as much as I can. 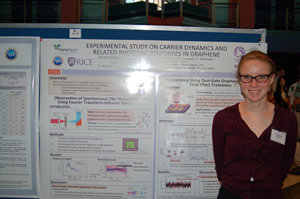 My research this summer was focused on two main projects which focused on photonic responses of graphene to laser stimulation. The first project was entitled “Observation of Spontaneous THz Photon Emission Using Fourier-Transform Infrared Spectroscopy.” In this experiment, we took advantage of the linear energy dispersion of graphene to achieve spontaneous THz emissions. Using a high powered infrared laser, we excited the electrons in graphene and then measure the emissions. By adjusting the frequency and subsequent energy of the incoming beam, we can set the conditions so that THz phonons will be emitted after no more phonons can be released. We were successful in using FTIR spectroscopy to observe the THz photons. However, the intensity was low so we cannot be sure that they are indeed spontaneous emissions of the sample. Future experiments can look at the pump power dependence of emissions and try to improve output. The second project I worked on was aimed at demonstrating the photomixing capabilities of dual-gate graphene-channel field effect transistors. We used a variety of devices to generate an input optical signal with two frequencies spaced 12.5 GHz apart. The G-FET sample was illuminated from above, and probed to induce different doping profiles. The resulting photocurrent was measured, showing the expected 12.5 GHz frequency. The resulting electric signal had much noise and future experiments can try to make the signal more clear. This experience showed me how difficult doing experiments can be. For example, the photomixing experiment proved to be very difficult. First the sample displayed nontransparent characteristics despite the energy of the input beam being less than the bandgap of the sample. To the best of my knowledge, we were unable to explain why this was true, but to continue with our experiment, we illuminated the sample from above instead of below. After overcoming this setback, we continued with the experiment and found that the sample was showing a strong 12.5 GHz photocurrent, but this frequency was also strong when the signal was being blocked. Critical thinking and experimentation led us to realize that one of the devices used to generate the input signal, the frequency comb, was giving off radio waves at 12.5 GHz that were illuminating the sample. Luckily, one of my mentors had a piece of absorptive material on hand that blocked the free space propagation of these radio waves and allowed us to complete the experiment successfully. All of these obstacles showed me how difficult real science experiments can be, but also how knowledge of the experimental set up and underlying physics can help to solve problems that arise. Since I just finished my freshman year, I’m trying to figure out what my academic interests are. This program was instrumental in helping me choose a major. Though I’m still not sure, since I really enjoyed my research this summer, I will focus on choosing between mechanical and electrical engineering. Hopefully my course work this coming year will help me make the decision. I am so grateful to have been able to see what an electrical engineering lab could be like this summer, especially since I have much time to adjust my academic path based on my experience. This summer has also encouraged me to pursue graduate school. Before NanoJapan, I thought it was something I might be interested in, but wasn’t sure if I wanted to spend so much time in school after graduating. But since I had such a positive experience working in Otsuji-sensei’s lab this summer, I now think I would both enjoy and get a lot out of graduate school. The idea doesn’t seem as daunting to me anymore. Again, I am grateful to have gotten this taste of graduate school at a time when I have several undergraduate years left to prepare for applying. Otsuji-sensei’s lab had a great sense of camaraderie. Everyone was very supportive of one another. The older students were constantly teaching younger students how to use certain equipment and they would work together to think through the experimental design. There were frequent lectures from professors aimed specifically at introducing key concepts that were relevant to the research. Thus, I found the students I had the pleasure of working with to be incredibly knowledgeable about the research. My mentor and other students were able to explain every facet of the experiment, only barred by occasional English difficulties. Otsuji-sensei himself was very welcoming and friendly towards his students, even having all of us over to his house for dinner one night. His never ending energy showed his great enthusiasm about his work as well as aptitude for teaching. During the experiments, I worked very closely with my graduate student mentor. He would explain how to do something to me and watch closely as I did as he taught me. Outside of experiments, I would always go with him to buy lunch everyday and I very much enjoyed getting to know him. I also had a research fellow mentor who gave me several helpful lectures. His teaching was extremely clear and straightforward, helping me to understand ideas I had been struggling with. 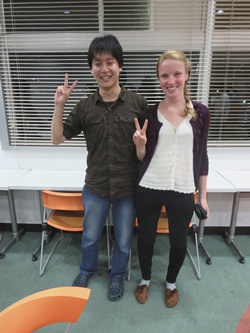 He also spoke fluent English and would sometimes help to bridge language gaps between me and the other students. 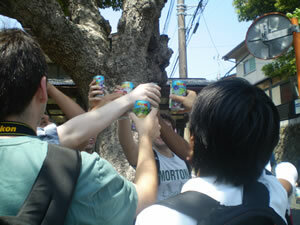 I socialized a bit with students outside of lab, but perhaps not as much as some other NanoJapan students. One way of maybe increasing out-of-lab communication would have been to stay later at night. However, I left every day around 6 since I was tired and encouraged to “enjoy my time” by my mentor. That being said, I felt like I got to know everyone in my lab, especially my graduate student mentor. Next year he hopes to come to the U.S. for research and I hope to visit him if he comes to Buffalo, since it is near my home town. My lab had a very lax starting time so I enjoyed slightly more sleep in the morning than other Sendai NanoJapan students, Ray and Michael, who had earlier starts. I woke up everyday around 9, ate cereal for breakfast and biked to lab around 9:40 to arrive at 10. My lab was very kind and lent me a bicycle for the summer, which I rode to Katahira campus everyday. Usually I would be one of the first to arrive to my lab, but other students stayed later than I did. At lab I would do experiments with my mentor, receive lectures, or study on my own. My lab mates gave me several books to read and noted the most relevant sections. At lunch time, I would go with my mentor to a konbini next to the cafeteria to pick out bento boxes which we would bring back and eat at our desks. At the end of the day, I headed out around six unless we were doing an experiment that went later. After returning back to my dorm, called Urban Castle Kawauchi (abbreviated UCK), I would make dinner with Michale and Ray. We went food shopping at Seiyu, which was 10-15 minute bike ride away once every couple weeks so that we had food to cook. I found this was a helpful way to save a little bit of money so that we could explore on the weekends. After dinner I usually hung out with the other NJ kids or talked with other people from our dorm. Since we were in an international dorm, it was interesting to hear everyone’s stories about what they were doing and how they wound up in Sendai. 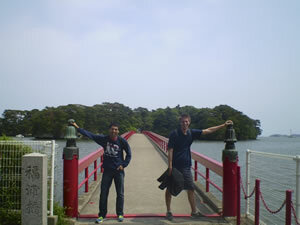 On the weekends I traveled around with Ray and Michael, and we were able to visit many places around Sendai. For travel recommendations, I asked my lab mates who were very helpful as well as other people in our dorm who had gone on similar excursions. And, of course, the internet helped a lot. I enjoyed life in Sendai. Downtown there were blocks of covered malls that each had different names. It was a great place for people watching as well as trying many different restaurants in Sendai. One of our favorites was a chicken place that could be identified by the chicken figure out front. The malls were also great for shopping and general merriment, although I never did that. The central street to Sendai is lined with trees, which I appreciated. Our dorm was in a area called Kawauchi (which I was told means “between the river”) and thus I had to cross a bridge over the river everyday to get to lab. The ride between UCK and my lab was quite scenic. Unfortunately we were in Sendai during the rainy season which meant it rained more days than not. Since I came equipped with only a mediocre rain coat and didn’t want to get up earlier to walk with an umbrella, I got quite soaked on many a ride to lab. Many people have learned to carry an umbrella while riding, but I didn’t think my already iffy bike riding skills were up to the challenge. Eating out presented the most difficult language challenges since most people at restaurants in Sendai spoke little to no English. Some restaurants had complicated rules that we often didn’t know before entering regarding drinks or a table charge. At one restaurant there was a preset menu that they started serving us automatically. At another place, we had to punch in our order on a number pad and the lady had to try to explain to us how to operate it. We also once went to a ramen shop and didn’t realize we had to buy tickets from the vending machine before getting in line. All of these times pushed our communication skills, prompting us to draw on our (minimal) Japanese as well as body language. Dragon Ball Z Soda: Several NanoJapan-ers got really excited when we discovered Dragon Ball Z sodas in a vending machine wandering around Kamakura. Tokyo is an incredible city. Before coming, I didn’t have many expectations except that it would be a very high tech city. So far this has proved to be true. From hearing stories of other NanoJapan students who wandered into the electronic district, to exploring arcades in Shibuya, to appreciating the fancy toilets, the high level of technology available in the city has been quite apparent. Since arriving, I have also been surprised by many things. Perhaps most of all, I have been struck by the orderliness of the streets. The city is almost completely devoid of litter even though I have struggled to find trashcans. Despite the large numbers of cars in some areas, traffic is far more orderly than any other large city I have visited. Also, before arriving, I thought we would stick out more as foreigners than we do. We talked about how Japan is known as a hallmark of a homogenous society, but foreigners are plentiful in Tokyo. However I have heard that our base location in Azubujuban is particularly international so this may be different once I get to my host lab in Sendai. 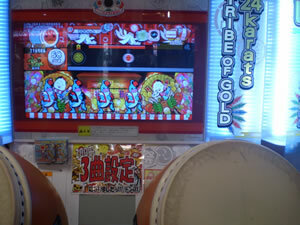 Taiko Drumming Arcade: We stumbled across this game at an arcade in Shibuya after our Taiko drumming lesson the day before. Learning Japanese is hard. Most of the sentence structures we have covered are ordered opposite to English; making it difficult to think of an English sentence and translate it in my head. The only other language I’ve ever studied is Spanish. In Spanish I could attempt to make up words by slightly varying the English word, maybe adding an ‘o’ or ‘a’ to the end. I thought this would be not at all possible in Japanese. This is proving to be false since I am learning just how many Japanese words are imported from English and written in Katakana. This came as an unanticipated pleasant surprise. At stores I can sometimes manage to read the writing on products by sounding out the Katakana. For example on the first day I needed to buy shampoo and Megan and I were able to sound out the letters to select what we thought was shampoo. Luckily we had Packard-sensei with us and she was able to confirm our guess before we made our purchase. Engaku-ji in Kamakura: Two KIP students spent the day with us and took us to beautiful temples and shrines in Kamakura. During the discussion with Japanese students, it was interesting to hear peoples thoughts about the difference between Japanese and American communication styles. The sensei had very clear experiences that illustrated a strong difference. However, many of the students, both American and Japanese, seemed to feel like the difference was far less significant than described by the sensei. This seemed to perhaps be indicative of a generation gap. Some of the KIP students spoke more limited English, which made discussion difficult. However, all in all, the conversations flowed well and we were able to hear what each other had to say. 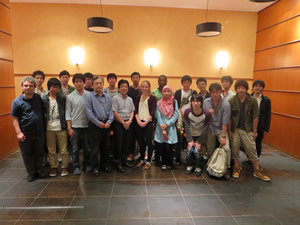 Although I personally did not exchange contact information with any of the KIP students, other NanoJapan students did and I have enjoyed going with them to meet up with some on other days. Two KIP students, Mami-san and Tepe-san, took all of Saturday to show us around temples around shrines in the areas surrounding Tokyo. They were absolutely fantastic company, incredibly knowledgeable, and put up with our myriad questions. On Sunday we met up again with Mami-san, for lunch in Asakusa and she showed us how to correctly order and prepare Monja, which was delicious. On the subway, or chikatetsu, people are very quiet. Almost every time we have ridden the subway as a group, we are far louder than any others on the train. Any conversations that people have on the subways seem to be between two people who are in close proximity to one another. While we think that it’s ok for us to sit on opposite sides of the car and talk to across to each other, this is clearly not an accepted activity. Adding to the quiet and tranquility of the subways, talking on phones is not allowed while riding. We have often had to use our gaijin free pass and pretend we don’t know this rule when half of our group accidently gets on a subway going the wrong direction or we have to tell others in a different car when to get off. Additionally, people don’t eat at all on the subway despite the fact that there are vending machines that tempt you with their goods right while waiting for the train to come. 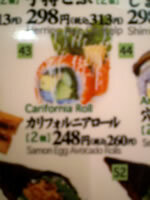 “Carifornia Roll”: Spotted at a sushi restaurant we stopped at. This is what happens when sushi goes to America, becomes Americanized, then comes back to Japan. During some hours of the day there are women only cars on the subway. This practice of separation seems to be more prevalent in Japanese society than America. My floor at the Sanuki Club, for example, is women only and men are never allowed on it. The dorm I will be staying at in Sendai is the same way. When it comes to deciding who gets the limited number of seats on the subway, there does not seem to be too much of a pattern, but people are generally apt to give up their seats to elderly out of respect. Just like America, many are tuned into their headphones or typing on their smartphones. However I’d say that I’ve seen a greater percentage of people reading on the subway here than on any sort of public transportation system I’ve been on in America. People stand close together and it gets very crowded during commuting hours. But in comparison to America, where people seem to always be in a rush, there is a very calm atmosphere in the subways. I rarely see people sprinting to catch a train or jumping on at the last minute. The subway system itself seems mimic this tranquility by being extremely reliable and timely. 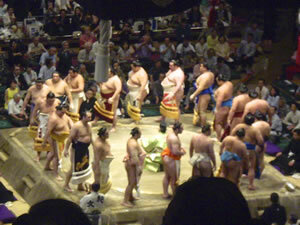 Sumo: The Grand Sumo Tournament was full of rituals that took far longer than the actual matches themselves. All of this fits in the larger context of Japanese culture and society. People seem to be a lot more content at being where they are than in America where everyone is always in a rush. The quiet and cleanliness of the cars themselves is mirrored in the streets of Tokyo, which are extremely clean, quiet, and orderly compared to other large cities I’ve visited. This seems to reflect the Japanese emphasis on harmony and balance, which entails having a positive, healthy environment. Hotaru Festival: Mami-san recommended we check out this festival in Asakusa. 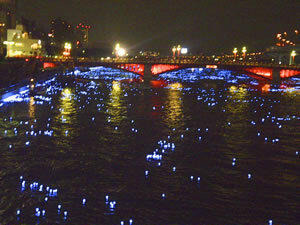 The whole river was lit up with blue LED lights. 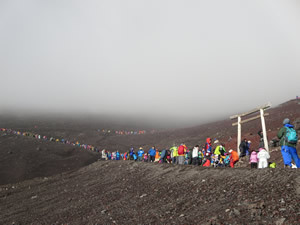 Last weekend we all went with KIP students to Minami Sanriku, a part of Japan that was devastated by 3-11. We saw many pictures of the town before the tsunami and then we saw the area as it is now, completely devoid of houses and shops, all washed away by the sea. 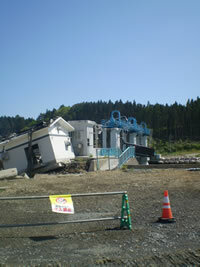 Many people had expressed how the region had been slow to recover after the disaster. This was clearly evident. While the ruins had been mostly cleared, little has been rebuilt and many people are still living in temporary housing, two years after the tsunami. The trip was particularly interesting for me because I was in Sri Lanka two years ago and saw damage from the 2004 tsunami there. Though most of the ruins had been cleared and much had been rebuilt, there were areas of remains of houses that had been destroyed eight years before. I could see how Japan’s stronger infrastructure allowed it to clear away the damage faster and more efficiently than Sri Lanka. I guess given what I had seen in Sri Lanka, and how everyone here was talking about how slow the recovery at Minami Sanriku had been, I was expecting it to be worse than it is. However it was still extremely poignant to see the people still displaced by the disaster and the fences and railings that had been bent by the force of the wave and have not yet been fixed. I so enjoyed going to the schools and playing with the children. I let a few kids play my violin on Saturday at the elementary school, which I enjoyed and hope they did too. The kids were so mischievous and full of energy. They weren’t at all intimidated by the language barrier and were eager to recruit us to play games with them. I played the most intense game of dodgeball of my life. Many of the KIP students held nothing back in their game but were evenly matched by the kids, which was fun to watch. The smiles on the kids’ faces make me hopeful for the regions’ future. So long as children are smiling, the future will be bright. The kids were also incredibly bright and excelled at the bridge building competition we presented them with. On my first day my mentor, Kawasaki-san came by my dormitory to pick me up in the morning. We arrived to the lab shortly after where I was introduced to my lab mates and other professors who work with Otsuji-sensei. Then Adi-san, a Research Fellow, and Kawasaki-san showed me around the lab. They explained to me the bare bones of how the different equipment works and gave me ample time to ask questions. I could look at the machinery in front of me and point to different parts that I did not understand. It was really helpful to be able to actually see what they were teaching me about instead of being lectured about the machinery in the abstract. My mentor, Kawasaki-san is very helpful and easy-going. He also speaks English well so the language barrier has not been an issue. My interaction with everyone in the lab has been all positive. They are all very friendly towards me, which I am very grateful for. Sometimes the language barrier gets in the way of more complicated conversation but everything that needs to be communicated is said. The lab seems to be pretty laid back as people come and go on their own schedule. That being said, many frequently work late into the evening and people are very focused when they are here. Everyone seems to have a great sense of humor and I look forward to getting to know them better of the course of the summer. Except for when speaking with me, all conversation is in Japanese. Group meetings are in a combination of English and Japanese. For example, today, the meeting was all in English, but last week it was half and half. A new professor recently joined the lab who is not Japanese, so perhaps they increased the English for his and my benefit. However, he speaks Japanese, so the English might be completely on my behalf. I am grateful for the English so I can understand what is being discussed but I know many of the lab members cannot understand as well. My housing is great. The dorm I am living in is filled with people from all around the world. Everyone speaks great English and it is great fun to hear about everyone’s respective countries and enjoy listening their varied accents. Regarding the building itself, it is about as nice as my dorm on at school. I have a small but cozy room all to myself. There are separate floors for boys and girls but there is a large dining hall where people congregate around dinnertime and another lounge complete with a ping-pong table and couches galore. My lab was very kind and lent me a bicycle for the summer, which I have been riding to work everyday. Research Project Overview: Otsuji-sensei laid out a week-by-week general schedule for my summer. The first few weeks are focused on my learning so I’ve been reading lots of chapters of books they have given to me. Later, after I have had ample time to study the field of semiconductor physics, I will start to conduct an experiment. My project will be about plasmons in graphene. The greater goal is trying to create a successful THz laser. I align THz and infrared pulses on a graphene sample at the same time. Part of the THz pulse will be reflected twice, creating a second pulse that will hit the graphene again. These past few weeks I’ve been doing a lot of reading. My mentor, Kawasaki-san, has provided me with many materials to read. I reviewed the physics of semiconductors from a book called Physics of Semiconductor Devices and am currently reading a chapter in Graphene: Synthesis and Applications that Otsuji-sensei wrote. For other questions I come across I have used many internet resources to help me as well as asked Kawasaki-san and Adi-san. I am very grateful to have so much time to study in these first weeks because I felt very confused before coming to the laboratory but now some things are starting to make more sense. Last weekend I went out for lunch with Ray and Michael and some friends from my dormitory. After we had eaten we wandered into a coffee shop hoping to buy some hot beverages since we were tired from staying up talking with people in the dorm the night before. Soon after we sat down, we tried talking to the waiter to order drinks but the language barrier soon became clear. Apparently the restaurant automatically served you food when you enter, so by entering you have agreed to a small preset menu. Since we had already eaten we were very full and did not wish to eat any more. We did not realize we had entered such an establishment until the waitress began serving us food. We knew that we would be charged for it and did not want to pay the extra amount. Thus we had to try to explain to the waitress that we did not want the food, but instead only wanted coffee. This was extremely difficult to communicate using our limited Japanese skills. Luckily a friend we were with spoke more Japanese than we did and with his help, along with an online dictionary, we were able to say that we did not want to consume any food at that time. We verified that we had successfully communicated this by asking how much our coffees would cost and recognizing that they cost as much as we expected. Pleased by our success, we were grateful to the waitress for letting us skip the preset food. Things only improved from there. Since the food had already been prepared, the waitress and chef decided to give us the food they had prepared for us free of charge. This made me feel a little bit guilty since we probably should have paid for the food as prescribed instead of trying to somewhat finagle our way out. Now I know in the future to be on the look out for restaurants where food is served automatically. If I were to happen upon such a place in the future I would probably just accept the food given to me and pay the extra price instead of trying ask for special arrangements to be made on my behalf. 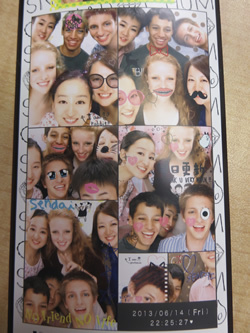 More Japanese Photobooth: I met up with Mai-san and Kazuki-san for dinner and went to a photobooth after. Omoshiroyama: Michael, Ray and I went on a day trip to Omoshiroyama just outside of Sendai. Research Update: During the last week I’ve spent a lot more time in the laboratories. My mentor, Kawasaki-san, is trying to shine a pump beam through a G-FET and I’ve been watching and assisting him in this endeavor. So far he has been unsuccessful. In theory, the beam should shine through and be visible to an inrfared camera since the graphene transistor is on silicon and silicon oxide, all of which should be transparent to this particular frequency of light. Kawasaki-san has spoken to Otsuji-sensei about this and they both think that the graphene might be scattering the light at the surface for some reason and thus a clear circle of light cannot be observed. During the experiment Kawasaki-san has taught me how to set up all the machinery to create the pump beam with just two frequencies. I have also practiced looking at the camera images to look for the spot of light and have also used the camera to locate the correct device on the transistor. When it became clear that observing the light spot would not be possible, we switched gears to trying to measure the photocurrent on the device instead. To do this, we set up probes and tried to measure the difference in current when the beam was on and off. Again, we have been unsuccessful so far. Kawasaki-san explained to me that he had previously run this sort of experiment on a different device and was successful so he hopes that if he continues to try different strategies, he will be able to collect good data. I have also spent time watching/assisting others do an experiment with a high power laser. First, they had to set up a system of mirrors to guide the laser emission into the machine that can run the FDIR. This required many hours of playing with mirrors and monitoring where the beam was going using electromagnetic radiation in the infrared region and infrared detecting paper. After this was aligned, we put a graphene on Si sample in the machine to measure the THz gain. At first there were basically no results but then Kurita-san noticed that the device had been aligned incorrectly. This was fixed and the results minutely improved, but the gain was nowhere near where it should be. One possible explanation for the small results could be that THz waves are being produced, but not so many. Thus to improve output, they may build a mirror cavity to amplify the output. Overall my lab seems quite laid back. While there are rules that govern interactions, they do not seem too intimidating. Everyone is very friendly towards each other and there is a great sense of camaraderie among all. There is a great deal of teaching that goes on here. Older, more experienced students teach others who began working here more recently about how to operate machinery and the physics behind the experiments. Those who joined Otsuji’s lab a few months back are ushered in through the help of other students as well as lectures from Otsuji-sensei and other professors who work with him. Mostly, people address each other by last name-san. On a few occasions, I have heard students use the suffix “kun” when talking amongst themselves but I would say it is not used most of the time. However Otsuji-sensei refers to all lab members by last name-kun. There have been several times when students have jokingly attached the suffix “sensei” to someone’s name to illustrate supreme knowledge on the subject matter. For example, one day when we were working on an experiment that was not going as planned, Etou-san and Mastura-san, fellow lab mates, started calling my mentor “Kawasaki-sensei” since he seemed to have all the answers. I have also heard Google jokingly be referred to as “Google-sensei” in the same spirit. I’d say things are a lot more laid back than I had expected from talks during orientation. For example, students of all ages and experience levels are asked for their thoughts on what the data means and are given adequate chance to express any ideas they may have. Though older students often take the lead on experiments, it is because they have the most experience operating the machinery and are teaching the younger students how to do so. One speech pattern I have noticed is that students often say “maybe” when answering a question I asked. While I at first thought this meant they were slightly unsure of their answer, I have since realized that this is not the case. My lab mates are exceedingly knowledgeable about the subject matter always know what they are talking about. This use of words like “maybe” and “perhaps” extends into every day life, just as we discussed during orientation. It is just a slightly more gentle way of stating a fact or request. Long hours seems to be a stark reality at Otsuji-sensei’s laboratory. Though many students do not come in until 11 am, it is not uncommon for them to stay well into the evening, sometimes going out to eat dinner and then returning. However during their time at lab, students work on their homework for class as well as specific laboratory work so perhaps their lab desk should be viewed more as an on campus spot to complete their lab work as well as a study space. While students do take an occasional coffee break and socialize, overall they are quite focused while at lab and the room that I sit in is silent for long periods of time despite the fact that it houses more than 10 students and teachers. 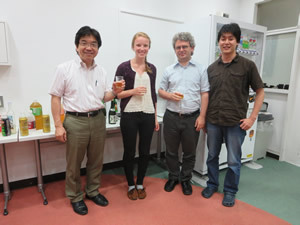 Research Update: This past week I have continued to help and learn from Kawasaki-san and Etou-san in their experiment. They are trying to show that a GFET is can transmit light at certain frequencies by shining a pump beam up from under the sample to observe a light spot with a camera the detects infrared light. Unfortunately this technique proved to be unsuccessful, possibly due to scattering at the graphene layer. To show that the light was being transmitted, even if it could not be viewed pictorially, Kawasaki-san tried to measure a photocurrent on the surface that should be induced if the light was reaching the graphene. To do this, he attached probes to the source and drain on the transistor and adjusted the voltage between them. Then he tried measuring the current while the light was blocked and comparing it to the current with the light on but found there to be no significant difference. The current was also relatively unstable and thus any small changes that may have occurred were difficult to observe. Kawasaki-san has been teaching me how to operate the machinery. He taught me how to turn on the light source and check to make sure that it was emitting the right frequency. I also moved the transistor under the camera to locate the right device. This was difficult since I always seemed to move it more than I intended despite making what I thought were very small movements. The image under the camera would suddenly change and then I would not know where I was on the device and have to find an edge to reorient myself. Luckily Kawasaki-san seems to know every inch of the device and was always able to tell me where I was when I was confused. I also helped to move the probes into the right location to measure the photocurrent. The conclusion seems to be that the device does not have the properties it should. Kawasaki-san plans to write to the company it was purchased from to inquire about this. The experimental set up is likely okay because Kawasaki-san and Etou-san preformed this same experiment on a different device and were able to observe the transmitted pump beam. They have spoken with Otsuji-sense about their problems and he agrees that there might be something wrong with the device since the results are not inexplicable at this moment. Perhaps my biggest accomplishment is shared between me, Michael, and Ray. On the weekends we have picked locations in the general vicinity of Sendai to travel to by train and sometimes bus or walking after. We have never failed to get where we wanted to go, despite the lack of English signs. A few of our hiking trips have tested our ability to find our way. While walking through the woods have encountered trail maps and signs that are completely void of English. Like children who have not yet learned to read, we have to look at the shapes and colors on the map and try to match them to what we see in front of us. 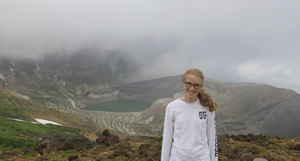 Last weekend we visited Zao and hiked up the volcanic mountain to see the Okama Crater lake at the top. On our way down our navigation was slightly less than stellar and we were not always exactly sure where we were. With the sun starting to move towards the horizon and the bus schedule telling us that we had limited time before the last bus left the little town of Zao Onsen, we made haste down the mountain and followed ski trails after we realized we had made critical errors and were not where we had hoped to be. Despite our previous navigational errors, we still managed to emerge from the woods in time to catch the bus back to Yamagata where we then caught the last train bound for Sendai. I’ve found it the ability to get where I’m trying to go to be empowering. One of my biggest challenges has been food shopping. Finding what I’m looking for at the grocery store is difficult since all the labels are in Japanese. During my first week here I cracked open an egg I had bought and was quite surprised when I realized it was not a chicken’s egg. Though I haven’t had too many food shopping mishaps, I heard another American here at our dorm talk about how he tried three times to buy vegetable oil but always managed to come back with some form of vinegar with very similar appearance to the oil he desired. Identifying food based on its appearance can be difficult, especially with different types of milk and spices. Though I can sometimes use Katakana to sound out the English words, if the writing is all in Hiragana or Kanji all I can do is guess. The other day I wanted to buy paste to make miso soup but there were so many different types to choose from and I had no idea what the difference were between them. Partially due to this reason, I have found myself buying the same things I successfully bought previously instead of branching out like I should. Research has been going well. In the third week I finished an experiment with my mentor, Kawasaki-san. Unfortunately the experiment failed to achieve the expected results but perhaps the reason why will become clearer later. After finishing, I wrote a report for Otsuji-sensei about my readings, lectures, and experiments during the first three weeks. Recently, I turned my attention to drafting my abstract and then I will tackle my poster. My Japanese language studies are progressing, but slowly. Since I spend all day listening to people talk in Japanese, I’ve picked out the words and phrases I was taught in Tokyo. This reinforcement has helped me to actually learn a lot of the material that we were introduced to during our stay in Tokyo. Sometimes if I pick up on my lab mates using a word again and again I will ask what it means. Kawasaki-san also sometimes teaches me some words, which I enjoy. I have heard there are opportunities for language classes and language exchange programs through Tohoku University and in the city of Sendai. Perhaps in the next few weeks I will see if I can take advantage of these opportunities but it is difficult to fit in my schedule. 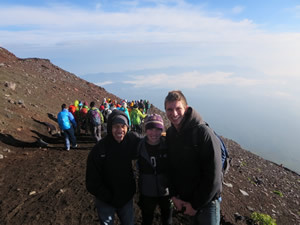 Okama Crater: Michael, Ray, and another student from our dorm hiked up Mt. 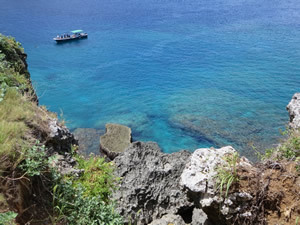 Zao and walked along the ridge till we found this volcanic crater lake. Navigating: Day hikes around the Sendai area are made more interesting by the fact that the signs are never in English. 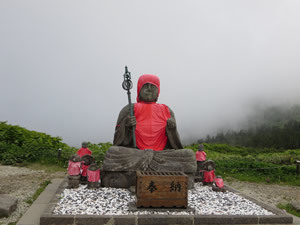 Buddha statue at the top of Zao. Research Update: I spent the past week writing a report of what I’ve done thus far. Since my mentor, Kawasaki-san, had finished the experiment he had been working on the week prior, he has been focused on also writing a report, making graphs, etc. for the finished experiment. The process of writing the report helped me to synthesize a lot of the information I had previously gone over. OIST was unlike any other university I have ever seen. Though geographically located in Japan, it seemed very far from it. Where most Japanese universities seem rigid in their hierarchy and process, OIST encouraged fluidity and breaking down boundaries. I enjoyed meeting its international student body and hearing how everyone found themselves going to graduate school on a small island in southern Japan. The vast resources of the university were very apparent. I am curious to see how funding continues in the future and how it is used by OIST. Right now it seems like a scientist’s dream land since professors were asked how they would design their ideal laboratory and then it is made into reality. It was great to see all the NJ gang again! I loved hearing everybody’s stories about their labs and various adventures. Everyone has had completely unique experiences in their labs and it was interesting to hear the wide variety. Research Update: While I was in Okinawa, Kawasaki-san and Adi-san found the source of the “ghost” frequency response of the G-FET even when the input signal was blocked. Apparently, the frequency comb was emitting 12.5 GHz radio wave signal that was exciting the sample. They were able to cover the frequency comb with a material that absorbs radio waves in that range which blocked the mystery frequency. From here, we should repeat the experiment with the frequency comb covered but I am not sure if we will have time. I began work on my poster and abstract and will continue working on them in the coming weeks. Today while waiting for the FTIR machine to run, Kawasaki-san asked me what kind of food I would like to eat for my farewell party. I said I was up for anything and then another one of my lab mates jokingly suggested that we go to McDonalds. With Micky D’s on the brain, I asked if they had seen or heard of the documentary Supersize Me. They hadn’t, so I tried to explain the idea behind the movie, which was a little difficult to communicate. They asked me what “Supersize me” means which was hard to explain, since it uses the adjective “supersize” as a verb. Luckily, Googuru-sensei came to the rescue as it never fails to do. Within moments, we were watching the opening ten minutes of the movie dubbed in Japanese. During down time during experiments, Googuru-sensei does wonders to cross cultural gaps. 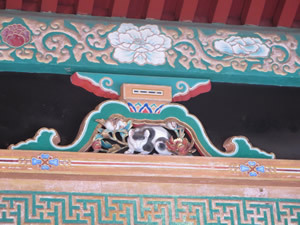 Whether it be translating words or providing photos to accompany descriptions, it has cleared up countless misunderstandings. Research Update: This past week I continued working on my abstract. I sent a draft to Otsuji-sensei who made edits and sent it to Adi-san to read over it and especially correct the English. Next I sent it to Kono-sensei for further edits. Hopefully tomorrow I will be able to do the final edits and submit. Unfortunately the laser set up we were using to conduct the photomixing experiment is now being used for a different experiment so we will be unable to repeat the experiment with the emissions from the frequency comb blocked. Instead, my focus shifted towards the FT-IR spectroscopy experiment. This week we measured the power dependence on emissions by holding the distance between the lens and sample constant and changing the intensity of the high-powered laser. The results showed that increasing the intensity increased emissions, although it was slight and a little hard to decipher. Today we held the intensity constant and instead changed the distance between the lens and sample, thus altering the focus of the input on the sample. The results will show how the power density relates to the emissions. So far we could see that the farther away the lens was from the sample (starting at the focal point), the greater the emissions. Otsuji-sensei expressed his wish that I put both experiments on my poster, since they both deal with the response of graphene’s carrier dynamics and photonic response to incoming optical beams. The proposed title is “Experimental Study of Carrier Dynamics and Related Photonic Response of Graphene.” However, my abstract deals with just the photomixing experiment. I hope this is ok. If I feel my poster is too cluttered with both experiments, I will just do the photomixing one. I interviewed Adrian Dobriou (Adi-san), a Research Fellow at Otsuji-sensei’s lab. Born and raised in Romania, he has lived in Japan for the last twelve years. He received his PhD in optics from Romania following his undergraduate education. When asked why he selected this field, he explained that he found enjoyment in his studies and he saw potential to make a significant contribution to the field. At the time in Romania, the five year undergraduate education was equivalent to a Masters degree. Before entering the PhD program, he worked in a research institute for a year. This experience cemented his previous desire to earn a PhD because it was evident to him that without one, he could only rise so far. He continued to work during his years as a PhD student. The PhD system he experienced was different from others. He didn’t have to take courses and he described it as more informal, with no deadlines. After graduating, he worked in Romania for 6-7 years before he was invited by a Japanese professor in Yamagata to join his laboratory studying optical coherence tomography which was very similar to Adi-san’s previous studies. Adi-san stayed in this laboratory for the duration of two years before searching for a new job. Deciding that he liked living and working in Japan, he searched for his next job in Japan. In 2003 he began working for RIKEN, studying THz which was a new field for him. However since this are of study had only recently emerged, it was new for everybody. The promising field was pulling in people from all sorts of backgrounds including electronics, optics, and spectroscopy. He remained at RIKEN for 9 years. Last year he moved to Otsuji’s lab at Tohoku University, continuing in the field of THz. Adi-san has found the working environment at Otsuji’s lab to be fantastic. In particular, the students are very well informed and very hard working. They never have to be asked twice and always take the initiative to figure out what needs to be done. The lab also has sufficient budgets to supply the expensive research. Although he has never worked in industry, he has less stress working in academic research than his colleagues in industry from the more lenient deadlines and different approaches to learning. His academic career has taken Adi-san many places. As a PhD student he spent short intermittent periods of time in Germany as well as three months in Russia, which he described as the same thing as Romania but on a much larger scale. After graduating, he spent half a year in France after receiving a competitive scholarship. Regarding the international nature of his work, he noted that RIKEN had a policy where something like 10% of its employees had to be foreigners. This meant that all the mail communication was English, which contrasts with Tohoku University, despite the fact that the university has plenty of foreigners. In Otsuji’s lab, there are two foreign professors as well as one student from Malaysia. The lab also often has visiting researchers and frequently sends its students around the world for conferences and short laboratory visits. The research papers produced are all published in international journals and thus receive feedback from an international audience. Conferences are very international and present a way of forming international connections. Particularly since THz is a relatively new field, there are relatively few producers of devices and thus it is often not possible to purchase devices from within Japan. Adi-san’s main advice was to make sure to do something you enjoy, especially when choosing a field to study. He noted that in research it is necessary to be creative and have a sense of purpose. Following new effects and phenomena can be tempting and prove valuable, but it is also important to continue what you have been doing otherwise you won’t achieve anything. Honesty is extremely important in the field, and lying or fabricating results helps no one. Finally, he said to know as much as you can about what you’re going to do before you do it. 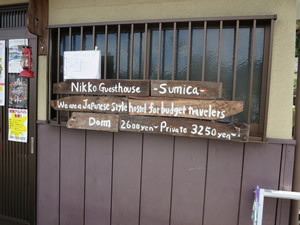 Showed up in Nikko at 9 pm with nowhere to stay for the night and wandered into this guesthouse where everyone was so friendly and welcomed us. Toshogu Shrine, Nikko: Hear no evil, speak no evil, see no evil. Research Update: This past week I have spent mostly working on my poster. I have almost all the information but am trying to figure out the best way to arrange and present it. I have also spent some time with the FTIR machine. We are trying to measure the dependence of the THz emissions on pumping power. Today we tried changing the input signal but found that the results were unstable. It was really sad to say goodbye to my lab. I didn’t realize how much I enjoyed being a part of Otsuji’s lab until the end. In the last week, Otsuji-sensei asked me to give a last minute presentation at the group meeting. At first I was nervous to speak in front of everyone, especially since I would be speaking about projects they knew much more about than I did. However after I got in front of them, I felt at ease and realized I felt connected to all of them, even if we had not shared too much conversation due to shyness on both of our parts, and the looming language barrier. My mentor, Kawasaki-san, will probably visit Rice University as well as SUNY Buffalo next summer. Since Buffalo isn’t too far from my hometown, I hope to be able to visit him. I am so grateful for all the time he spent with me this summer, taking me to go get lunch, as well as countless experiments. During my farewell party, I played violin for my lab group at their request. Although initially hesitant because I was so out of practice, I obliged. I’m really glad I was able to play for them. I wasn’t sure if it was going to be worth it to bring my violin along for the summer since I knew I wouldn’t be able to practice much. However, being able to play for temporary housing men at Minami Sanriku as well as my labmates definitely made it worth it. I’m realizing how much I enjoy playing for people, not as a demonstration of skill, but rather because music is something everyone can appreciate, no matter what language we speak. Music brings us closer. This program made me realize the extent of my prior ignorance towards Japan. Having previously spent time in India, I assumed I would be able to draw parallels since the two countries since they are both in Asia and both far from the US. I could not have been more wrong. After spending the past three months in Japan, I can safely describe it as the anti-India. Japan’s calm efficiency contrasts strongly with India’s noise and disorder. I have an incredible appreciation for how smoothly everything runs in Japan which I will miss after I leave. During our debriefing sessions in Houston, one phrase that often came up is that “everything in Japan just works.” This could not be more true. A good example I remember is twice when I was trying to put more money on my Pasmo (a card you keep a running balance for to use during subway travel), the machine went slightly astray and did not give me my change. Instead it started beeping which made me a little nervous because it was drawing attention to me and I had no idea how to fix it or make it stop. Both times I had nothing to be worried about because a person popped out of a little hidden opening right next to the machine I was using, took one look at the machine, and handed me my change. I also remember one time during my weekend trip to the Kansai region, a group of construction workers who had just painted new lines on a street maybe the day before, were carefully going over the edges of every line and chipping off any extra paint, making sure they were perfectly straight. This level of attentiveness gives Japanese society an appearance of running very smoothly. Coming back to America highlighted the excess of our society regarding energy use and pollution. I was shocked to walk into my hotel room in Houston to find all the lights on, the air conditioning running, and the TV on. In the building I worked in this summer, the hallway lights only turned on when a person was walking down. We could learn a lot about energy conservation and recycling from Japan. The bike I used all summer had a light that was powered by pedaling. At first I found this surprising and mentioned it to Michael who said, “Well, that’s Japan for you.” I realized he’s right. My initial amazement at the lack of litter on the streets of Tokyo was maintained over the course of the summer. The extreme cleanliness of the streets has to be from something more than a fleet of government sanitary workers. It must be at least in part contributed to a consciousness of the people to not throw their litter on the ground, but instead carry it with them until they find the next available trash can. This is something we should strive to achieve in America. This summer was incredibly influential towards shaping the rest of my academic career. Perhaps most importantly, I have confidence in myself as a researcher. Last year I thought about trying to join a professor’s lab group but was far too nervous to send the emails necessary to make that happen. Partially, my apprehension stemmed from the fact that I had no idea what it meant to work in a lab. This summer not only taught me what it means to be a part of a lab, but it also made me feel like cutting edge research was attainable for me, with the wisdom and guidance of more experienced students. I will definitely join a lab this semester and hopefully that will become an integral part of my college experience. Before this summer, I wasn’t sure if grad school was in the picture for me. Though I hadn’t ruled it out, I thought perhaps I could be satisfied by my B.S.E. and that would be enough to get a job. While I do think it would be enough to get a job, I now don’t think I would be fully satisfied with my job. Pursuing a graduate degree would allow me the most choices in my career and give me the freedom to pursue research that could make a difference in my field. Introduction: use the dual-gate G-FET to preform photomixing. Our goal was to shine an optical signal with two spectral peaks spaced 12.5 GHz apart to generate a beat-note in a G-FET, stimulating a photocurrent with a frequency of 12.5 GHz. We then probed the device to induce p-i-n doping and measured the photocurrent. This provides a method of converting between optical and electric signals as well as detecting THz waves. It has applications in airport security and ultra broadband wireless communications. This will allow the photomixing abilities of G-FETs to be compared with photomixers that currently exist on the market. Approach: First we had to generate the input optical signal using a variety of devices including a CW laser, frequency comb, amplifiers, filters, and an AWG. We then shined the beam on the device from above after observing that the device displayed nontransparent characteristics despite the energy of the photons being less than the bandgap energy. Results: We were able to successfully observe a peak in the photocurrent at 12.5 GHz. However, it is relatively small and there is much noise so a clearer result. Discussion: We successfully demonstrated the photomixing abilities of the dual-gate G-FET with a differential frequency of 12.5 GHz. Future Research: Improve clarity of signal; decrease noise. Try different differential frequencies. Research Presentation in Tokyo: I enjoyed the experience of giving a short presentation at the symposium in Tokyo. We were each given a time constraint of five minutes and asked to talk about both our research project and our experience living and working in Japan. Given that this was our first chance to present like this and this is a lot of information to synthesize, we almost all went over our speaking times. I hope we did not bore and frusturate the audience too much. Before the presentations, I thought we would each repeat much of what had already been said by our peers. However this turned out not to be the case which highlighted the diversity of our experiences as well as how much there was to talk about. Preparing for the presentation helped me think through the key aspects of my project that I needed to note in presentation, and realize the less important details that I could skip. 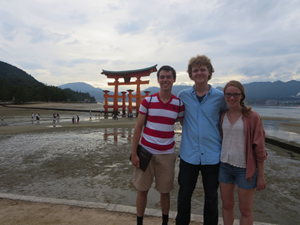 For the portion that pertained to my experiences in Japan, I focused on how the program has helped to shape my academic plans moving forward: it has helped me choose a major and inspired me to go to grad school. Although I was somewhat dreading the poster presentation during the days leading up to it, I found I actually enjoyed presenting my poster. It was nice to be able to hold real conversations with educated people about my work and it made me realize just how much I had learned over the summer (and also how much more there was to learn). Re-Entry Program: The part of the reentry program I found most helpful dealt with how to market this experience. In particular, I appreciated the resume help. Follow-on Project Plan: After my experience this summer, perhaps a follow on project at Brown University to spread the word about NanoJapan would be more effective and plausible than the initial follow on project I had proposed. Maybe I will see if there is a study abroad or summer internship fair I could set up a booth at. Or I could at least post flyers in the engineering building. Maybe I can meet with Dr. Matherly’s contact at the International office at Brown and see if she has any ideas for what I could do. It’s strange to be at home writing this report and to know that I just spent the last three months in Japan. Especially because I’m surrounded by people who weren’t with me and can only understand my experience through the words I use and photo props I may choose to share. It’s tempting to relate every conversation back to Japan but social tact tells me that may not be the best idea. Teeth Pa-ti: After practicing our posters, Sendai crew brushes its teeth together during the last night in Houston. Michael stares pensively off into the distance, wondering where the future will take him and how he got to be so good looking. Ray is giggling because he hopes no one will notice he is posing with a razor since didn’t have a toothbrush at the ready. I’m smiling because I could not have asked for better company this summer. Kanpai to Sendai crew. 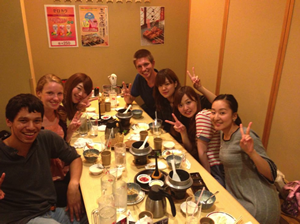 Pre-Departure Tips: Study Hiragana and Katakana. Especially Katakana. 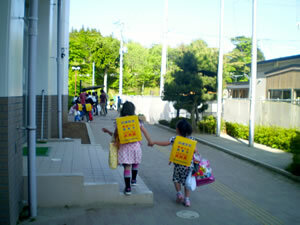 Hiragana will help you most for language classes, but Katakana is most useful for daily life. It can help you decode menus and food at the supermarket. Having it down will be endlessly useful over the summer. Be sure to enjoy your time in Tokyo, don’t get too bogged down in the language classes and reports or preparing for your research lab. I personally felt a little overwhelmed, especially by the nanoscience lectures that were quite over my head at the time. But there’s plenty of time to study that after you go to your host lab, and they don’t expect you to know everything. Try karaoke for a good group bonding activity. Visit Tsukiji fish market even though it’s painfully early. If you can, take taxis to get there in time for the tuna auction. Listen at the airport for potential gate changes. When we were flying back to Sendai we almost missed our flight but were luckily easily identified as three gaijin by a flight attendant who notified us of our error and whisked us off to our plane. Bring sunscreen and a sun hat. Wear a shirt while going snorkeling. I got badly burned even with layers of sunscreen. Maybe stay later at lab every now and then to see what people are up to in the evening. Everybody is very friendly and welcoming although a little quiet at times. Don’t be afraid to use the coffee maker. If you stay at UCK, know that the knives are in cabinets under the sink. Rainy season is during June and July so if you’re going to ride a bike a lot I recommend either getting a full body rain suit or learning how to ride a bike while carrying an umbrella. I did neither and got very wet. Check out Tohoku’s Oktoberfest for the ultimate cross cultural experience. Bikes are really helpful, especially if your lab is at Katahira campus. Otherwise, the city is very walkable, it just takes a while to get places. There is only one subway line in Sendai and city buses, although I never took either. Food shopping can help to save money. There are two food stores: Seiyu and Co-op that are about a 10 min bike ride away. They were both similar but Seiyu was possibly a tad cheaper. 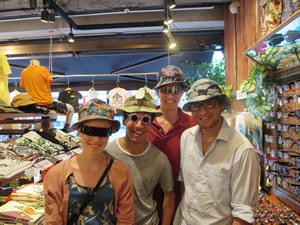 Meeting up with KIP students in Sendai is a great way to meet people who aren’t in your dorm or lab and they might show you some cool places or restaurants around the city. Study Katakana. It will be infinitely helpful. 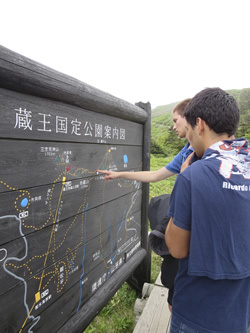 Learn the Kanji for places you’re going to visit so you can easily find it on maps or signs. Practice Japanese with your mentor. They will get a kick out of your somewhat pitiful attempts and can teach you some fun phrases. 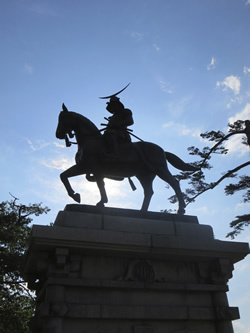 If you want to study more, look into taking free classes through Tohoku University. There was also some language exchange program I heard some other students in our dorm did where they practiced their Japanese with Japanese people and the Japanese people practiced their English with them. Crocs. Lots of guys in my lab had them. Excellent for being water proof and easy to take on and off. A good raincoat. If you have rain pants or a full rain suit, that’ll do as well. Good walking shoes. We walk a lot. 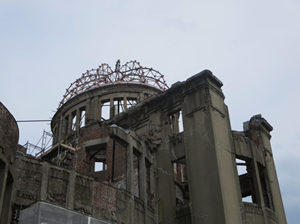 I most recommend a trip to Hiroshima. Especially as an American it’s an important and meaningful place to visit. Near Hiroshima, Itsukushima Shrine is a great stop. 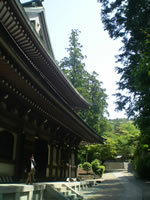 Kyoto is great for temples. If you go, check out a restaurant called Ninja Kyoto. 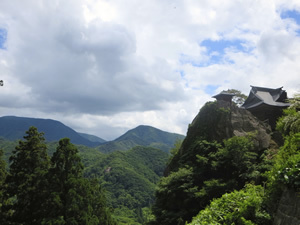 Nikko isn’t too far from Sendai and has amazing temples. 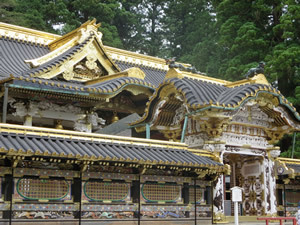 I recommend Toshogu Shrine in particular.